To experience psychosis is to temporarily lose your connection with reality. It can involve hearing voices, delusional beliefs, confusion and difficulty communicating. Psychotic episodes are common to a number of severe mental health conditions, including schizophrenia. Not all experiences of psychosis are negative – but some people may be hospitalised after a particularly serious episode. So what happens when they’re discharged, if their mental health difficulties persist? What if they no longer have a home to go to, or anyone to care for them? After seven years of cuts to health and social care, what ongoing support still exists? These questions brought me to a supported housing unit in south London, run by the charity Certitude. It helps those with long-term mental health issues – and often with accompanying drug and alcohol problems – to move towards more independent living. I spent a week with its 19 residents, and the team that supports them, to understand what had brought them here, and some of the challenges they face as they work towards recovery. AN UNREMARKABLE three storey brick block sits on the corner of a residential street not far from Brixton. It’s somewhere I’ve walked past many times over the years without ever noticing it, let alone stopping to consider who might live there. Inside are 21 simple bedrooms, the majority of which share bathrooms and kitchens. There’s a TV lounge, a games room, a laundry and a garden at the back, along with an office and sleeping quarters for the staff. It could pass as a youth hostel – but to live here, you need a referral from Lambeth’s Community Mental Health Team (CMHT). Its purpose is to prepare its vulnerable residents for a life beyond its walls. People are free to come and go as they please, although they have to be buzzed in by reception each time they return. Some have moved here from local psychiatric hospitals, others from similar supported housing schemes. Residents typically spend two years here, trying to build up the confidence and skills to be able to cope on their own. 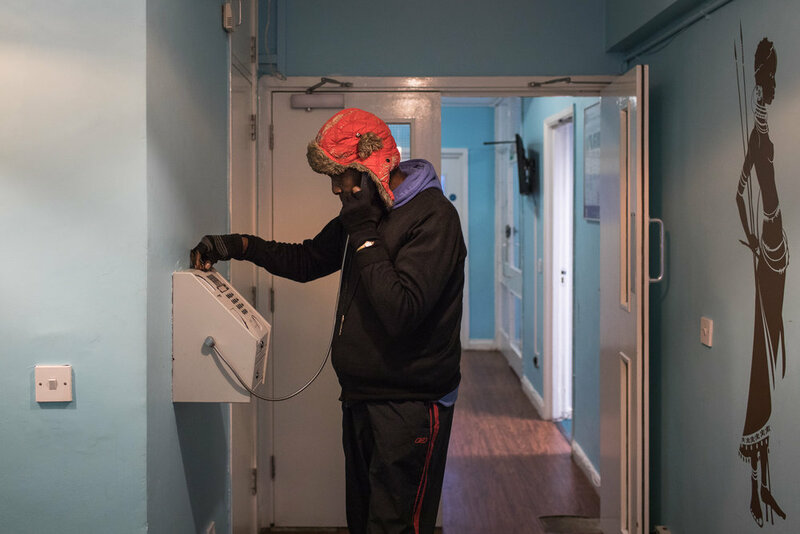 I’ve been asked by Certitude not to disclose its location for fear that some of its tenants might be targeted by drug dealers, or others hoping to exploit them. I have also changed some of the residents’ names. The building provides a safe roof over their heads, but the team also support them with their medication, help them to set a daily budget and manage their money and debts, liaise with their CMHT care co-ordinators, accompany them to appointments – and much else besides. The building is staffed 24 hours a day. Residents buy and cook their own food and are responsible for washing their clothes and bedding and keeping their rooms and the shared kitchens and bathrooms tidy. That often doesn’t happen. Staff encourage them to do these things every day, but never do it for them or force them. Some rooms are very messy, a handful are immaculate, most are somewhere in between. As time passes, they’ll be expected to start managing their own medication and take responsibility for things like visiting their GP and dentist. In theory, it is intended for people with medium and high needs – but Yewande, who manages this and four other residential services in Lambeth for Certitude, explains that cuts to mental health budgets mean they’re getting referrals for higher and more complex needs than ever before. The most common diagnosis here is schizophrenia. As I learn, that is a very broad term, and each person’s illness and triggers differ significantly. It carries with it some very negative connotations, but contrary to popular perception it is not normally a violent condition, but rather one that makes its sufferers vulnerable to exploitation by others – and statistically considerably more likely to become victims of violence themselves. It affects around 1% of adults in the UK. Many of the residents here have dual diagnoses, meaning that they also have a drug or alcohol problem – something that frequently goes hand in hand with severe mental health conditions. “A lot of people use substances as a way of managing their symptoms and moods,” says Yewande. In some cases drug use may have led to their mental health problems, in others it’s a case of self-medication. A quarter of adults in England have been diagnosed with a mental illness at some point in their lives, recent research suggests. Mental illness can affect anyone – but statistically those who are unemployed or claiming benefits are at significantly greater risk, especially those living in densely populated, deprived urban neighbourhoods. Not surprisingly the same is true for many aspects of physical health. Mental and physical health are inextricably linked. Poor physical health can lead to poor mental health and vice-versa. Those suffering from severe mental illness, for example, are considerably more likely to develop diabetes and die from heart disease. The most prevalent mental health issues are forms of depression and anxiety. Schizophrenia and other diagnoses with presentations of psychosis are much less common, but they too are more likely to affect people who are struggling financially. In times of economic hardship – and specifically austerity, where governments cut back health and social care, as has been in the case in the UK since 2010 – there is growing evidence that poor and vulnerable people are at even greater risk of physical and mental illness. Jakub experienced his first psychotic episode when he was 17. He’s 24 now and has been living in the block since June. He traces his mental health issues back to when he started taking amphetamines as an adolescent in Poland. “It was a big problem [there],” he says. “You could buy it in shops. I was 12 years old when I first started taking it – a friend gave it to me. When I was 14 I started to realise it was a problem.” His addiction led to the episode and his first hospitalisation. He was diagnosed with schizophrenia. “All the problems with my mental health come from amphetamines, and from alcohol,” he says. He came to the UK to escape his self-destructive behaviour, and did largely leave amphetamines behind. His issues with alcohol, however, persisted. For a few years he was getting by, working in pubs and coffee shops in London. In 2016 that changed, however, when he was fired from his bar job for being drunk at work. “Things fell apart really quickly after that,” he says. “I was already behind on the rent, so the landlord kicked me out.” Initially he stayed with a friend, but there were already six people living in four rooms there and he had to leave after a few days. Eventually, he ended up on the street. A day centre in Victoria called The Passage found him a hostel bed and after a few months Lambeth Council placed him in temporary accommodation. But he was still drinking and his mental health was far from stable. He was referred to his current home by Lambeth’s CMHT. He says when he first arrived he was using it like a hotel – a roof over his head at night while he spent his days out drinking with friends. Since then, he’s stopped drinking, has found a part-time job and is engaging with Certitude staff and his CMHT care co-ordinator. The team are clearly very pleased with his progress. “I haven’t had a drink for three weeks now,” he tells me. “After two weeks I got a job, so I’ve been working as a kitchen assistant.” Longer term, he hopes to retrain, possibly to work in IT. It’s difficult to square the person I’m talking to with some of his experiences. He’s so together, so confident and articulate, there’s nothing in his manner to hint at what he’s been through. When he mentions his family, his whole face lights up – he talks to them almost every day and his parents have flown over from Poland to visit him here in the block. “It’s not such a great place for your parents to see you,” he says drily. 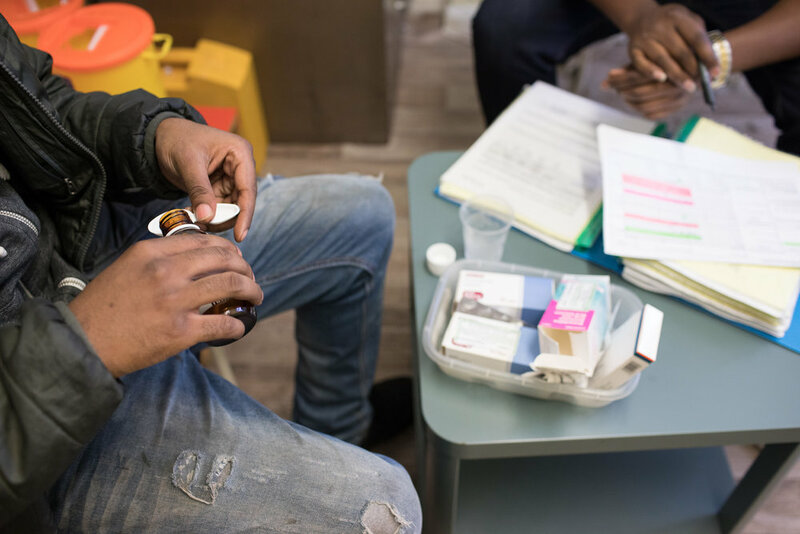 The team in the building are there to provide practical support, but they’re not employed as drug counsellors or therapists – although they tell me that cuts to these resources mean they often end up taking on these roles to an extent. Yewande says that the relationships the staff build with the residents – or customers, as they call them here – are vital if there’s to be any hope of improvement. Michael has been here since January 2016, but he explains this isn’t his first stay. “Back in 2005 I was here for three years,” he says. “I moved to a couple of other supported blocks [after that] until I got my own flat in Dulwich.” He was on the perfect trajectory – but his recovery proved fragile. “When I got the flat I wasn’t really taking care of myself,” he says. “Too many people were coming over and I was smoking too much weed.” In the end he was so unhappy there that he gave up the flat and went back to hospital. He’s 31 now and is frustrated to find himself back where he started. “I’m getting ready to go back into independent living, but I had a flat,” he says. “Now I have to start all over again.” His tone is one of anger and confusion, rather than self-pity. His mood shifts during the week. When we first meet, he’s buoyant and tells me that he’s feeling good because he’s just started a new exercise regime. He talks about wanting to get a job or go back to college. Towards the end of the week, he’s withdrawn and dejected. “I just get annoyed with myself,” he says. “I don’t understand it. I could try to move on from smoking, but every time I get money, I just spend it on drugs. My mum knows what I do and sometimes that gets me upset.” He pauses. “It’s like I don’t care about my life.” He tells me that he’s attempted suicide in the past. Daniel moved here about nine months ago. He’s become good friends with Michael in that time. The team tell me that organised social activities tend to be poorly attended and while there’s a pool table in the games room and a garden with benches, they’re rarely used. Despite this, there is clearly a camaraderie among some of the residents – shared cigarettes sat outside the entrance, a walk to the shops to get food, watching TV in the lounge. Daniel is 26 and tells me he’s been hospitalised three times, including one particularly difficult spell when he was moved to six different units in 13 months after getting into a series of fights. His problem, he says, is controlling his anger, something he’s struggled with since childhood. The first time he was taken to hospital, he was 18. “When they came for me at my mum’s there were 15 people in my house! Police, social workers.” His mum had called the police. They’d been having arguments because he’d disappear for weeks at a time. “No one explained to me what was going on. I was so confused, asking, ‘why are you doing this? If you’re going to arrest me, arrest me.’” He laughs. “Everyone feels like Nelson Mandela in there – locked up, indefinitely. It’s not like jail.” He was attacked by another patient at Lambeth Hospital so they moved him to Lewisham and then back to a different ward at Lambeth. “They were overmedicating me,” he says. “I was tired every second. When I refused they gave me an injection. It took five people to hold me down.” When he was finally discharged, he went back to live at his mum’s, but he says that nothing really changed – they were still having arguments, he was still getting arrested. Eventually he was hospitalised again. Most recently he was at the Maudsley, which he says was a very different experience. “It went ok, I didn’t get into fights, but it was the worst hospital I’ve been in. People there are on a different level – there was no one I could talk to.” From there he was referred to Certitude. Fewer and fewer housing blocks like this exist. Several of the residents tell me that they moved here because the supported services they were living in closed due to cuts. A total of £6bn has been shaved off local councils’ adult social care budgets since 2010. In addition to this, around 40% of NHS mental health trusts have seen their income fall each year since 2011, despite government pledges to increase funding. At the end of my week I ask the team how they’ve seen government cuts affect both mental health services and the residents themselves. The names of some residents have been changed.